Rosmarinus officinalis is a wonderfully aromatic plant with a wide range of uses. An herb steeped in folklore and tradition, “There’s rosemary, that’s for remembrance,” Ophelia says to Laertes in Shakespeare’s Hamlet. The plant has long been used as a memory strengthener, and in Elizabethan times appeared at both weddings and funerals as a token of remembrance. Besides the beliefs that add to the lore of this beautiful plant, rosemary provides great culinary flavorings, is used in toiletries and potpourri, and appeals to gardeners as a simple decorative container plant. With all these accolades, its only drawback is that it cannot survive cold Long Island winters outdoors. With some preparation, however, you can ensure your rosemary plant will follow you indoors and out throughout the years. 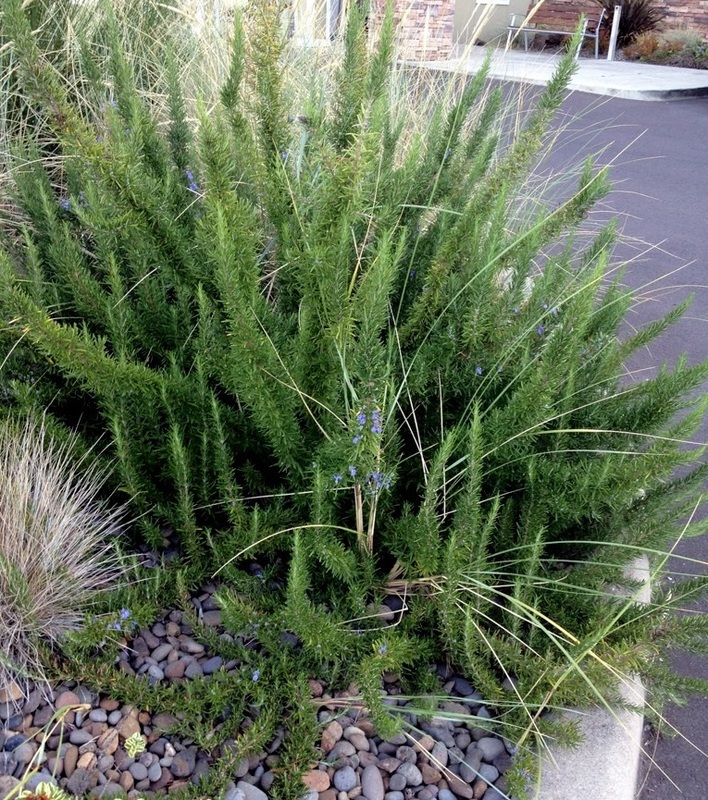 In-ground rosemary thrives in coastal California, but not in colder Long Island landscapes. Photo © Sandra Vultaggio. To understand how best to conserve your plant, consider where rosemary thrives. Its botanical name, Rosemarinus, comes from the Latin words ros, meaning dew, and marinus, meaning sea. “Dew of the sea” probably refers to the herb’s native habitat among the misty cliffs of the Mediterranean seaside. Rosemary is winter hardy to USDA Zone 8-10, just shy of our cooler, Zone 7 climate. The herb enjoys growing in light, slightly acidic, dry-to-medium, well-drained soils in full sun. Much like the lavender you may already grow, rosemary has very good drought tolerance and cannot abide wet, heavy soils that usually prove fatal to it. If you intend to keep your rosemary plant alive during winter, bear in mind its Mediterranean home. Since we aren’t able to grow rosemary in our landscapes, keeping it in a pot is often better than planting it in the ground. A well-draining clay pot gives its roots the breathability they crave. Use a high-quality, lightweight potting mix, and consider amending it with additional perlite. This will aid in drainage and keep the media loose, which helps mimic the conditions where the plant grows naturally. Provide a water-soluble fertilizer every two weeks if the growing media doesn’t already contain fertilizer. During winter, keep the soil in the pot evenly moist: not wet and not dry. A clay pot allows the soil to dry out sooner than non-porous pots do, so use your finger to test soil moisture and decide when to water. Water the plant deeply, allowing water to run through the pot and into the catch tray. Discard the water that runs through. The two most important factors you must remember about growing rosemary indoors during winter is that it will not tolerate wet feet or dry air. Forced hot-air heat inside the home can dry out its foliage quickly, so misting the plant weekly is important. Keep rosemary indoors somewhere where it gets bright light but also stays on the cooler side. Follow these tips, and come the spring thaw, your rosemary plant should still be thriving. Once all danger of frost has past, take the plant out of the pot, tease its roots apart a bit (cutting out a small portion of them if necessary) and add some fresh potting soil. Place the re-potted rosemary outdoors in a full-sun location for the remainder of the growing season, and enjoy its beauty again for another year! This entry was posted in Indoor plants, Long Island gardening, Vegetables and tagged bringing plants indoors for winter, clay pots, fertilizers, herbs, Long Island gardening, Mediterranean plants, misting, perlite, rosemary, Rosmarinus officinalis, well-drained soil, Zone 7 on November 3, 2015 by Robin Simmen. Robin Simmen is Community Horticulture Specialist for Cornell Cooperative Extension of Suffolk County. She can be reached at 631-727-7850 x215 or at rls63@cornell.edu.